Our programs are available to 1.6 million utility customers of Portland General Electric, Pacific Power, NW Natural, Cascade Natural Gas and Avista. 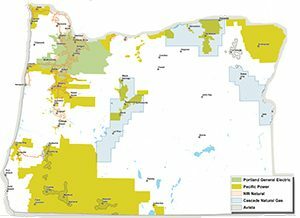 Together, they represent 74 percent of Oregon electricity customers and nearly all the natural gas customers in Oregon. We also serve customers of NW Natural in Washington. We work with each utility to ensure energy efficiency is the first fuel they use to meet their customers’ energy needs. Energy efficiency is the kilowatt hour of electricity or therm of natural gas not used. It’s a low-cost and reliable resource. In addition to adding energy efficiency and small-scale renewable power to the resource mix, we coordinate with our affiliated utilities around customer service, customer outreach, program delivery and marketing services. Each utility is committed to helping customers save energy, and many offer renewable power options that help you do your part for the environment.